George Entwistle may be the new Director General of the BBC, but the current one, Mark Thompson, was to be found in County Hall this morning alongside representatives of the other shareholders for the launch of YouView. 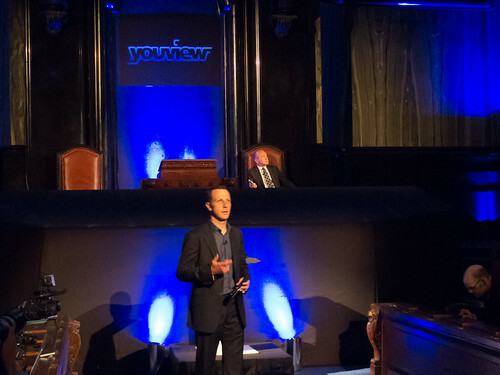 Lord Sugar – chairman of YouView – kicked off procedings, although most of the demostrations were conducted by CEO Richard Halton. It’s been a long time in gestation, but now it’s here, it’s actually quite smart. In essence, it’s a connected Freeview PVR. And there are already plenty of those on the market. But that probably underplays the power of it. What you have is a very smart and very slick looking EPG which at first glance is just a list of Freeview channels. But the neatness comes in the way that on demand functionality is built straight into that EPG. If you go forwards in time then you can set it to record that programme as usual. It also does clever things like suggest the HD version if you’d prefer. But if you go backwards in time, then you can see what was on TV – say yesterday – and if you select that programme (and it’s available on demand), then it’ll launch the relevant on demand service like iPlayer or ITV Player and boot up the programme. It means you can reach programmes within just a couple of clicks which makes it very powerful. Of course if channels want to include pre-roll advertising then that’s fine too. The search functionality is also excellent. In the demo, we saw the letters “EM” immediately suggest Emmerdale (no – not my choice) and selecting that brought up something like a month’s worth of episodes, as well as another TV show and a radio programme which both featured cast members. What’s clear here is that metadata in programming information will be key. It’s going to be no good just saying that Jeremy Clarkson is a guest on your show. You’ll want to say “Jeremy Clarkson from Top Gear” is a guest to ensure that viewers searching “Top Gear” are offered your programme’s interview! The search functionality is really smart visually and shares the kind of “guessing” that Google does in search now. It makes the whole thing look very slick. From the demonstrations, it was clear that the box will come with on demand offerings from the major shareholders, the BBC, ITV, Channel 4 and Channel 5. They’ll offer their usual deep archive offerings – so that means Father Ted or Black Books on 4OD for example. However YouView won’t be offering a central payment mechanism. So if and when ITV launches its micropayment mechanism later this year, they’ll have to manage that themselves within their on demand environment. That’s also the case with other providers. Lord Sugar was quite clear on that point. It also doesn’t seem likely that there’ll be advertising within the EPG itself. Once you get into a channel provider’s environment, that’s up to them. Radio didn’t get much of a mention, although the results of search certainly bring up radio programmes which is great – and takes me back to my metadata point. Initially it seems you’ll be limited to stations available on Freeview. But here’s hoping that there’ll be other ways of getting radio on the device! There are plenty of “empty slots” on the box to fill, and we were told that STV and Now TV from Sky are likely to be early arrivals during the summer. What Sky offers isn’t clear right now, but I’d imagine it’ll all be on a pay-per-view basis. We’ll have to wait and see. There was also no sign of either Lovefilm or Netflix. I think it’s safe to say that they’ll also get onto it soon. 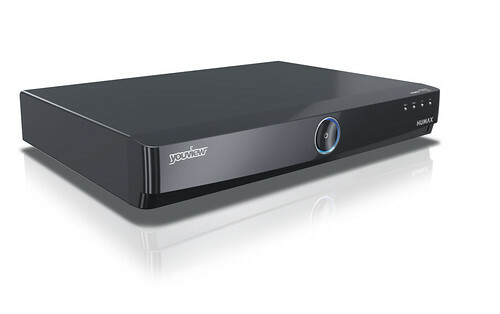 Interestingly the two ISPs that partnered with YouView will each offer their own branded versions of the boxes. Essentially, they’ll have their own programme offerings. I’d imagine that BT will package in BT Vision for example. What TalkTalk offers, I’m not sure, but we’re told they’ll tell us all later this month. The first box will come from Humax, who’ve long worked in this area, producing some of the most popular Freeview PVR boxes. Lord Sugar was very complimentary about them. It’ll cost £299 at launch, since it comes with twin tuners and a hard disk for the PVR. I think some will be surprised at that price point as it’s still quite high based on the fact that the target market is those who’ve not signed up for either Sky or Virgin Media. But clearly prices will come down, and Sugar suggested that there might be a much cheaper “zapper box” with a single tuner and no PVR functionality that could be priced at something more like £99. This technology could then be embedded into other devices including connected TVs. And the box is likely to be heavily discounted to subscribers of BT and TalkTalk who take certain packages from them. I’d anticipate free TV “data” for those subscribers without caps. And I speak as someone who’s had to help their parents confront data “bill shock” when they ate through nearly 40GB in a month of watching iPlayer via a Sony BluRay player. Incidentally, those who buy this box and are on tight usage deals with their ISPs may need to revisit their internet packages fairly promptly. If you’re not with a partner ISP, you may find that even their “fair usage” hoves into view quite swiftly! 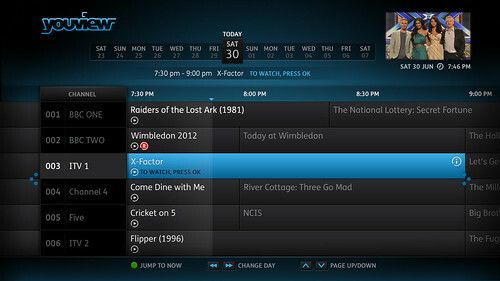 The Humax box will be in all the main retailers by the end of this month – which I think is sooner than many expected. In what quantities I’m not sure, although Sugar – employing some of his Apprentice terminology – said that orders from the retailers were very strong and much larger than he’d expected. One slight disappointment with the box is that it requires an ethernet connection and doesn’t come with WiFi. That might be a hurdle for those who’s routers are not within cabling distance of their TVs. Homeplugs and the like may be the answer for those who don’t want to start drilling holes in walls. I wonder if WiFi dongles will prevail. I’d imagine future devices will include WiFi, although testing may have revealed non-optimal user satisfaction via WiFi. Sugar claimed that new entrants could get onto YouView for as little as £50,000 and that’s a really low price point for what could be a substantial platform. There are challenges for YouView, but they’re not necessarily that insurmountable. Connected TVs are big business and all the TV manufactures have their bespoke systems already in play. I suspect that it’ll shortly be impossible to buy a TV set without at least one included system. But that leads to fragmentation. Do I use Apple’s system? Or Sony’s? Or Xbox’s? Or Samsung’s? Or LG’s? Or, now, Google’s? YouView could consolidate some of that fragmentation. Sony, Samsung and Apple (OK – maybe not Apple), could all make their offerings available via YouView. But I doubt they will for a while. Perhaps one lagging TV manufacturer might jump into bed early. It’s difficult to say. But I’m certain that this is not a white elephant that some are saying it is. The UK broadcasters behind it mean that it isn’t. Apple doesn’t have iPlayer. Google doesn’t have… well… nobody really knows. And all the TV services have their own strengths and weaknesses. Whether we’ll see Facebook or Twitter integration will be interesting further down the line, but as they kept emphasising during the presentation, this isn’t for the bleeding edge consumer who probably already has this functionality. It’s for everyone else. Will I be buying one myself? Probably not. But that’s not because I wouldn’t like one. I already have a Sky HD box, as well as a couple of older Freeview PVRs – one of which lets me burn programmes to DVD. I’ve no need for one. But in time, I’ve no doubt that future purchases will come laden with YouView functionality if not just a standalone YouView box themselves. And there’s no doubt that that EPG functionality is really smart. Have you ever used TiVo? As far as I can fathom, YouView’s EPG doesn’t actually do anything that Virgin Media’s TiVo can’t. Even the backwards/on demand feature is available on TiVo! YouView does have the advantage of being available to anyone with DTT reception. But to me that is about it. TalkTalk’s IPTV service (closed to new customers) features a very extensive range of channels. They could really stick the boot in to BT Vision if they wanted. But will they? Time will tell! Nope. I’ve not properly used TiVo. However, I really don’t think YouView is aimed at either Virgin Media TiVo or Sky HD customers. They’ve already made the step. It’s aimed at everyone else. The challenge will be getting people to run an ethernet cable into their set top box. My point really is what makes YouView so special? It doesn’t do anything that no other device can do. As far as I can see it is merely the fact you can buy a box in a supermarket or department store. I wonder how compatible a YouView box is between service providers? For example, if I buy one from a shop and then subscribe to BT at a later date, will my box work in the same way as one they’ve supplied directly?